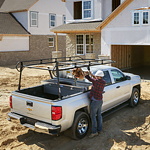 In a Chevrolet Silverado 2500HD, you can have confidence knowing that your truck has the capability to handle your work load. Its towing capacity is impressive, at up to 15,400 pounds with a diesel engine under the hood. Whenever customers come to Paillé Berthierville looking for a reliable truck, we suggest they take a look at the Silverado 2500HD. Two engines are options on the heavy-duty truck. The first is a Duramax 6.6L turbo-diesel with eight cylinders. With this model, it's almost as if you can do anything, as it has 445 horsepower and 910 pound-feet of torque. When you want to slow things down, there's no need to worry; it has an available diesel exhaust brake to help with deceleration. The other engine is a Vortec six-liter V8. It has 360 horsepower and 380 pound-feet of torque. It's paired with an automatic, six-speed transmission.